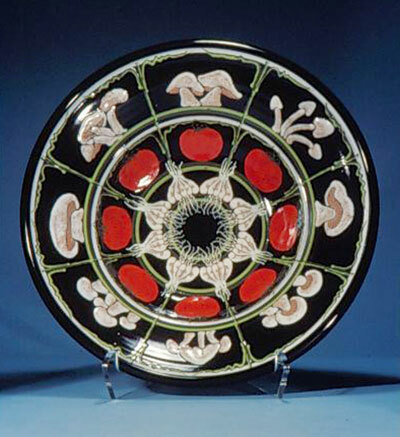 Tyrone and Julie Larson have been practicing studio potters since 1966. Tyrone does most of the wheel work, while Julie concentrates on glazing, painting, and designing new pieces. The life of their clay work has evolved over the years with several dramatic changes. They respect the intuitive spark, and go where the process sends them. Their most recent work refers back to Julie’s Italian heritage. 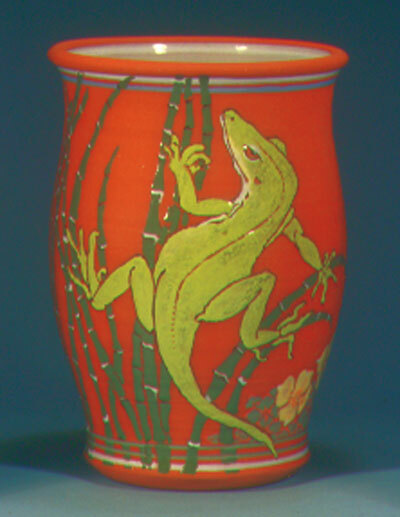 She has personalized a very old European technique of painting directly on the raw base glaze with a heavy application of colored glazes in a manner similar to slip-trailing. The layers of glaze fuse during a single high firing, with the layered glaze thicknesses resulting in a raised effect. The porcelain clay body achieves a refined surface and form, and enhances the brilliance of the colors.